Methods in Immunology and Immunochemistry, Volume III: Reactions of Antibodies with Soluble Antigens provides information pertinent to antigen–antibody and hapten–antibody reactions in vitro, in free solution and in gels. This book presents the development of research in immunology and immunochemistry. Organized into three chapters, this volume begins with an overview of protein–antiprotein reactions. This text then discusses the inhibitory activity of protein fragments, which suggested that antigenic combining sites of proteins were limited regions of the whole antigen molecule. Other chapters consider the measurement of inhibitory activity, which is still the principal assay to characterize antigenic sites of proteins. 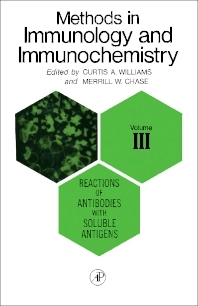 This book discusses as well the immunological techniques prior to the development of gel-diffusion methods. The final chapter deals with fluorescence labeling techniques that provide powerful approaches for exploring the thermodynamic and kinetic parameters of antigen–antibody interactions. This book is a valuable resource for mathematicians and immunologists.